Ihlara Valley is 38 km (23 mile) far to Aksaray centurum. 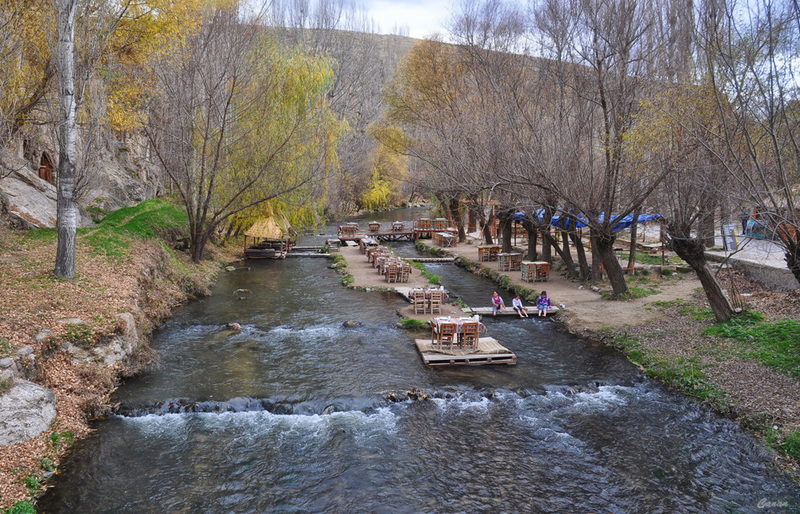 Ihlara Valley, which is 40 km from Aksaray and 7 km from Güzelyurt, is the flower of the Cappadocia Region. 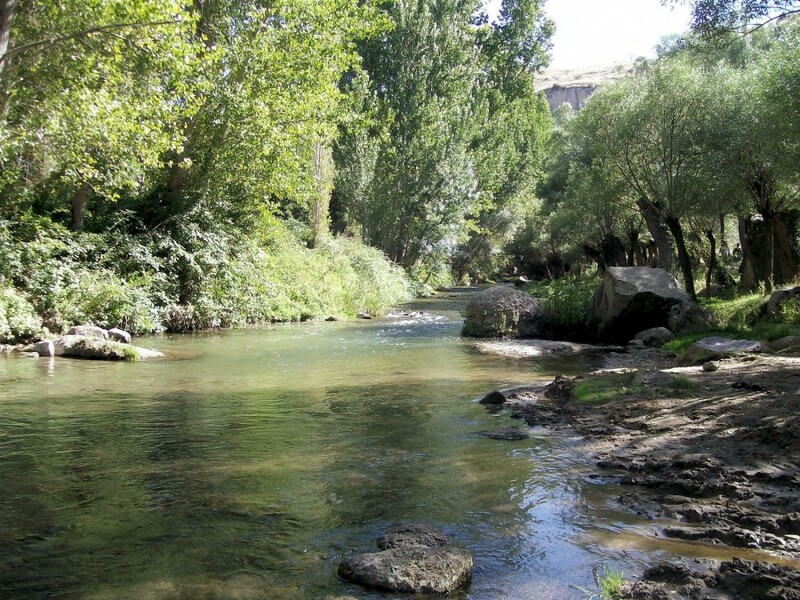 With its perfect nature, rock carved churches in the valley slopes and the enchanting visuality of Melendiz brook, it awaits its visitors. The sound of the Melendiz brook separating the valley with steep slopes, whispers the story of the past to its vistors within the verdant forest. The rock carved churches with frescoess along the 14 km along the walking track reveal the magnificance of the Christian civilizations in the Ihlara Valley. Purenli Seki Kilisesi is also located in the first quarter of the valley, around 100m from Kokar Kilise. You have to climb about 25m above the level of the river. 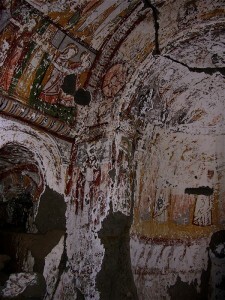 It is composed of an entrance, a burial chamber and a double naos, separated by pillared arcades, each having an apse. 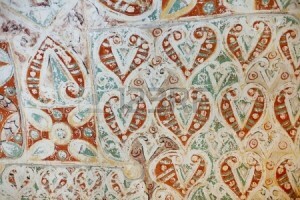 The church is covered by frescoes classified as “archaic” but characterized by exquisite details, a strong sense of design and amazing freedom of expression. On the wall opposite the entrance there is a fresco of Daniel in the Lion’s Den. The left cross-arm contains the Annuciation, the Visitation, the Nativity and the Magi. The right cross-arm contains the Flight into Egypt, the Baptism and the Dormition. 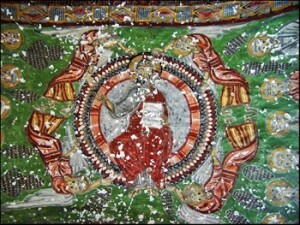 The Dormition of the Virgin (Koimesis) is unique as far as Cappadocia is concerned. It is composed of two scenes. In the first scene, Mary is lying on a bed, with Christ accompanied by St. John sitting on one side of the bed to recover her soul. In the upper scene Christ is shown holding his Mother’s soul, with an Angel behind him.